Must get the physical copy! Stonehouse’s biography went out of print. There was a 50th Anniversary edition created but is likely a small scale production. If you’re looking for a good biography, there is only a limited supply of this title. I’m not sure other biographies are as good since they aren’t first-hand accounts. 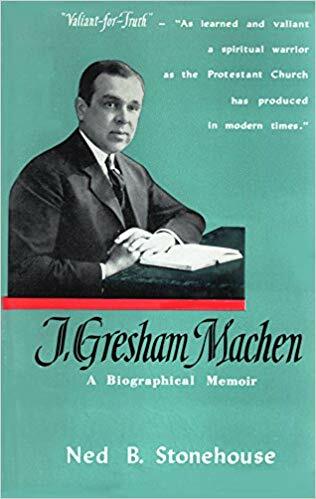 A monument to the great leader of the modern evangelical movement and the author of many classical works of apologetics, this definitive biography of J. Gresham Machen by his intimate friend, associate and successor, is based upon a vast amount of letters, memoranda and other documents (filling nearly thirty drawers in the Machen files) in addition to the author’s personal reminiscences, and an evaluation of Machen’s published writings. An intimate and personal account which leaves no aspect of Machen’s full and brilliant life untouched. Ned B. Stonehouse’s full-scale portrait is a vivid and inspiring picture of a Christian of apostolic ardor who, at his untimely death in 1937, was called ” the first Protestant in the nation.” Acknowledged by his critics and admirers alike as the greatest leader of the whole cause of evangelical Christianity in modern times, Machen raised the intellectual acuteness of Protestant orthodoxy to a point where observers such as H. L. Mencken and Walter Lippmann claimed that in the religious debates of the twenties and thirties, the liberals had yet to answer him. Ned B. Stonehouse (1902-1962) was a minister in the Orthodox Presbyterian Church and Professor of New Testament at Westminster Theological Seminary in Philadelphia for 33 years, from its founding in 1929 until his death. After studying under Machen at Princeton, he was Machen’s intimate friend and associate for more than seven years, and later was his successor.